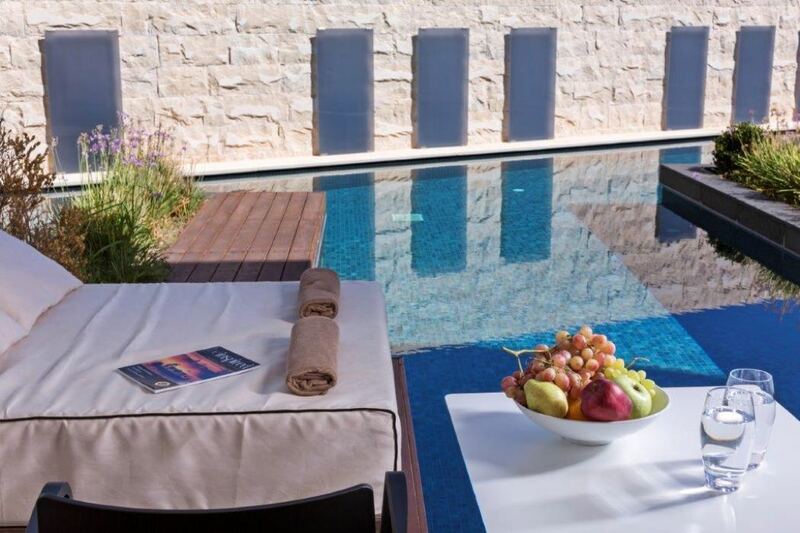 Aqua Blu Boutique Hotel & Spa was voted one of the top 25 hotels in Greece for 2016 and is a proud member of Tresor Hotels & Resorts & Small Luxury Hotels of the World. 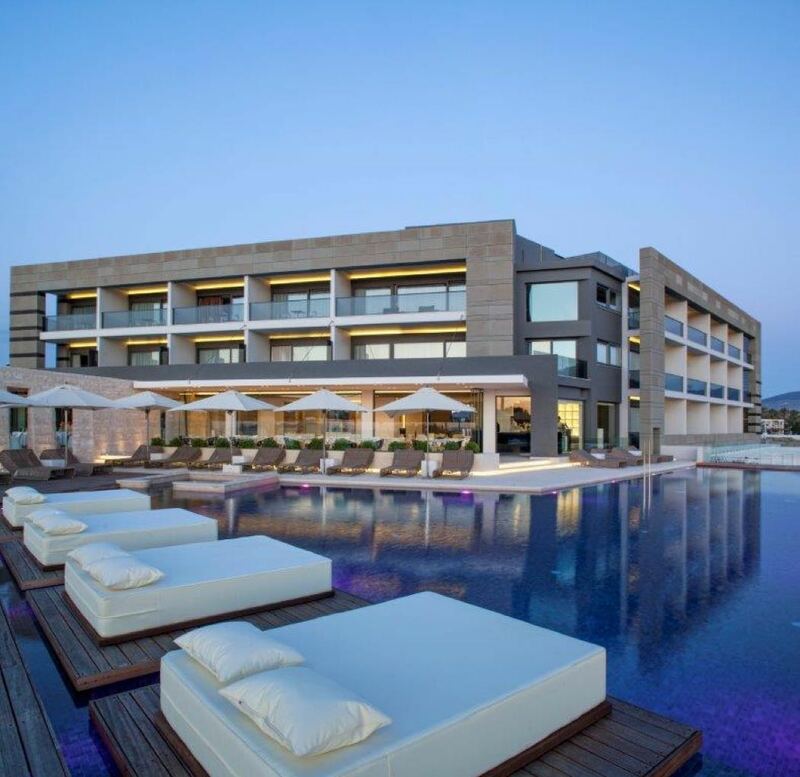 It is the only luxury boutique hotel on the island of Kos. The picturesque harbour of historic Kos Town, with its charming shops, museums and waterfront restaurants, is just a 15 minute stroll away, or a 5 minute bike ride away along landscaped cycle tracks. 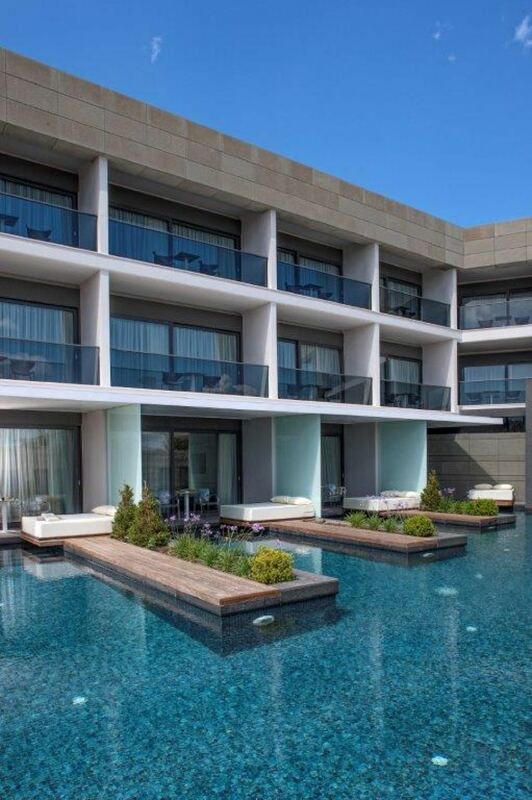 This beautiful hotel is perfectly positioned adjacent to the best beach on Kos. 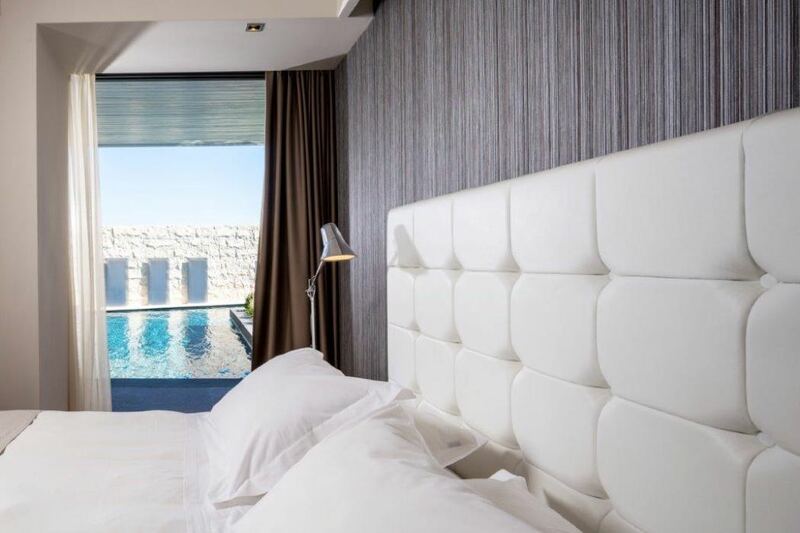 Set in contemporary building that overlooks the sparkling Aegean sea, the hotel’s ultra modern stone-walled buildings are surrounded by bright blue pools and stylish water features. In fact many of the bars and restaurants seem to float on mini pontoons that jutt out into pools of water. 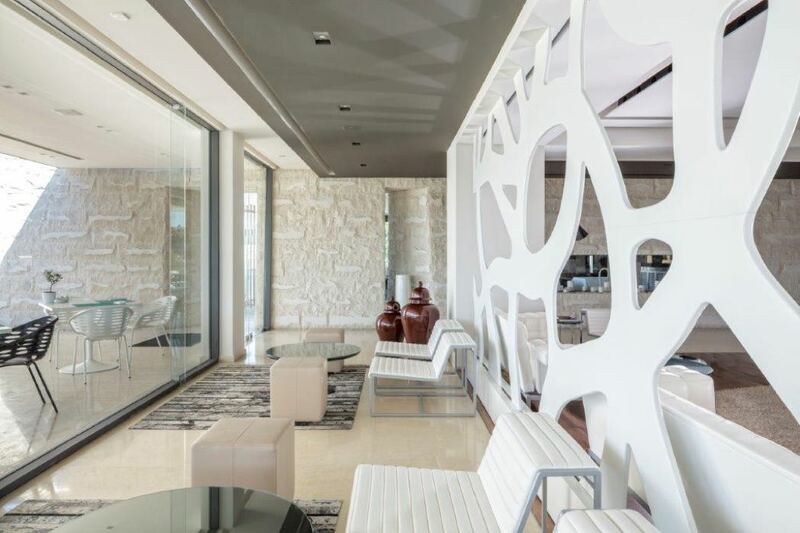 This all-suite hotel offers beautifully designed rooms with a stylish modern decor. Every suite has whitewashed walls, light wood floors and an open plan design, with dark wood pillars separating the bedroom from the bathroom. 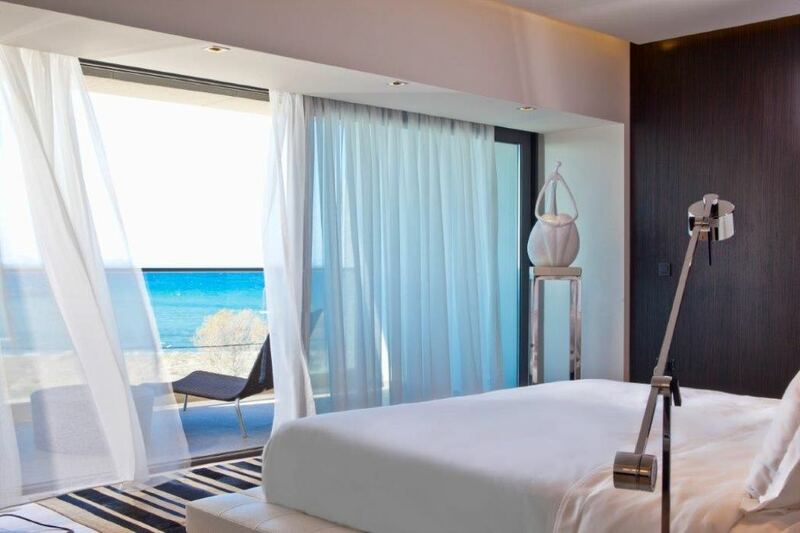 All suites have a balcony or terrace overlooking the sea. 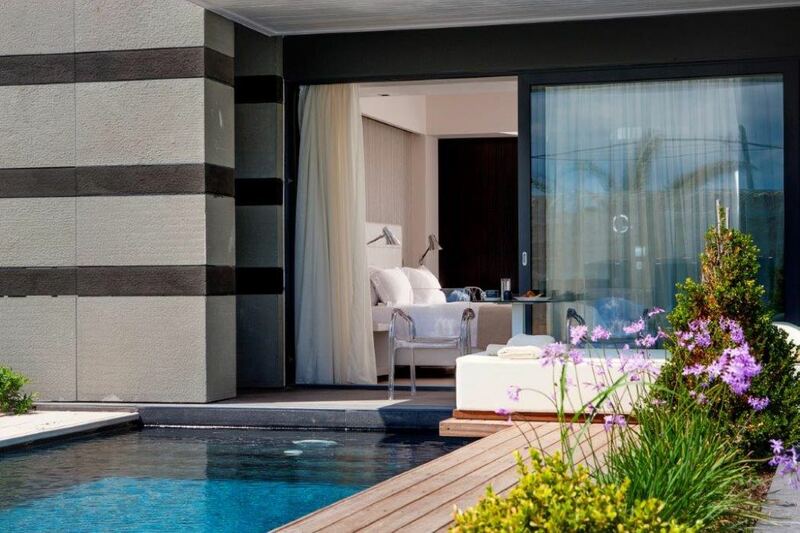 The “Pool Signature Suites” also have their own private pool where the verandas drop straight into your own 30sqm pool so that you can literally get up, open your doors and jump right in. 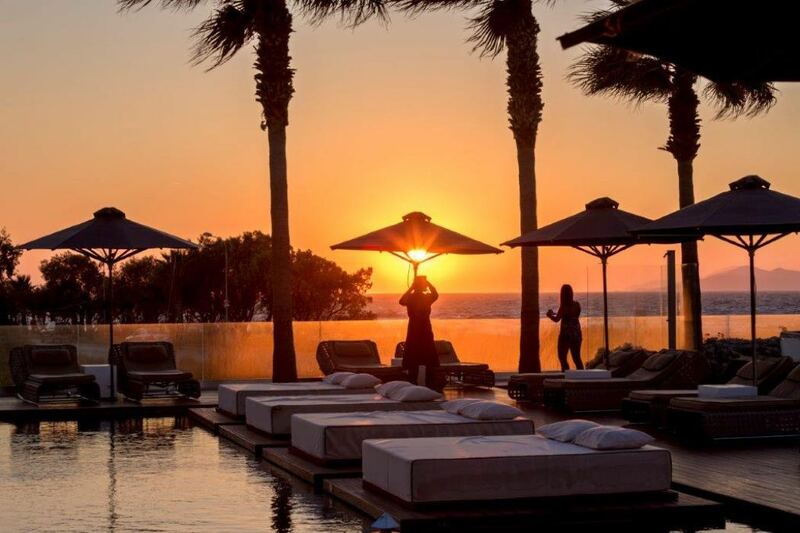 Poolside or not, these terraces are the perfect spot to wind down in the evening and watch the sunset. 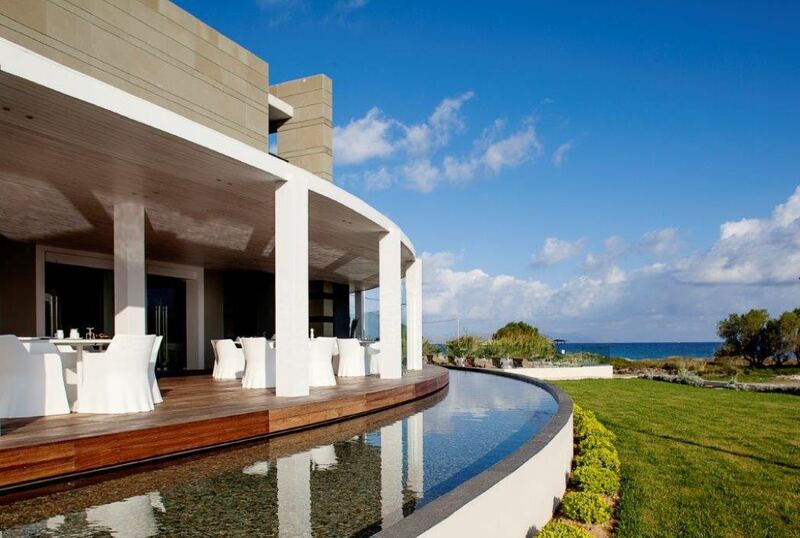 Enjoy breakfast alfresco with the same spectacular views to the Aegean sea from the hotel veranda. In the evening, lounge on the large sofas around the bar and enjoy the chill out vibes and the calming soft beige palettes of your surroundings. 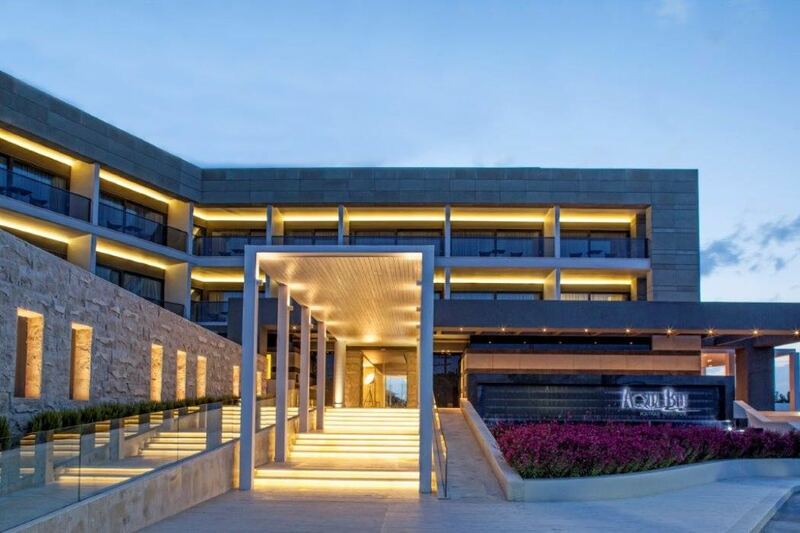 Aqua Blu’s Cuvee Restaurant is the number one culinary destination in Kos and features creative mediterranean gastronomy. The poolside restaurant serves up light bites and delicious cocktails throughout the day and the beach club will serve cocktails and nibbles to your sun bed so that all you need to do is relax. 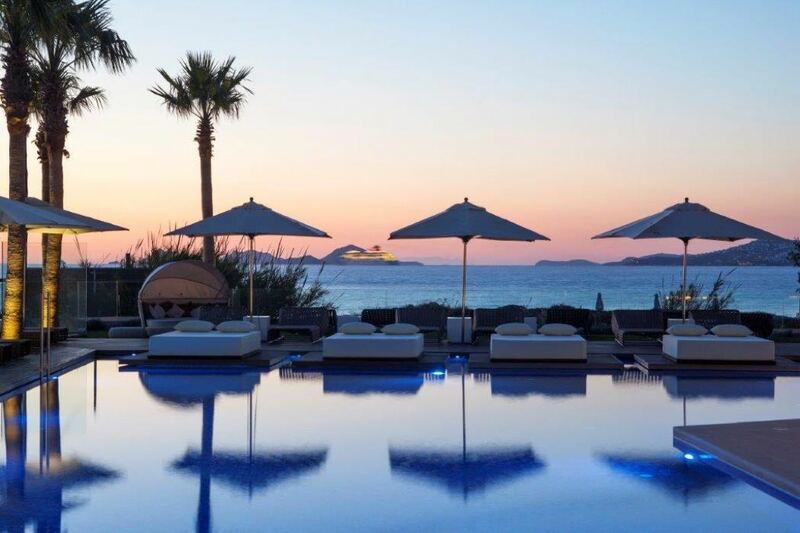 The hotel adjoins Lambi Beach, one of the largest and most attractive beaches on Kos Island. Lambi Beach stretches out from the harbour and around the headland which sits beyond the hotel. This beautiful east facing beach offers a variety of water sports, sun beds and umbrellas, restaurants and beach bars. 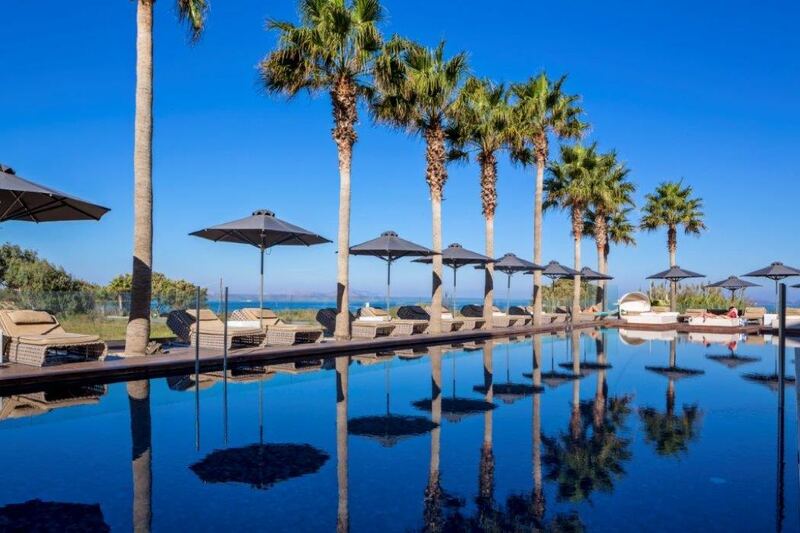 Relax on one of the loungers or double cabanas under the swaying palms by the large pool. 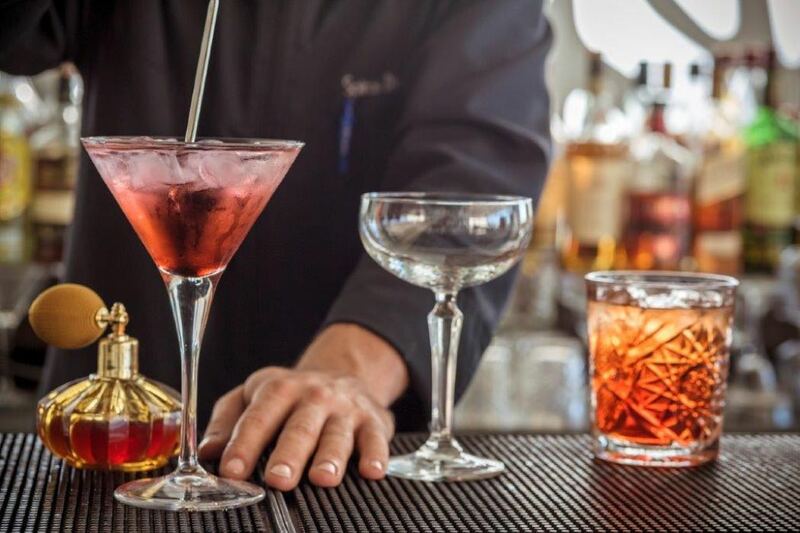 The pool bar makes a selection of colourful cocktails that you slowly sip under the blue Grecian sky. The inviting health centre incorporates a spa, a gym, a beauty and hair salon. 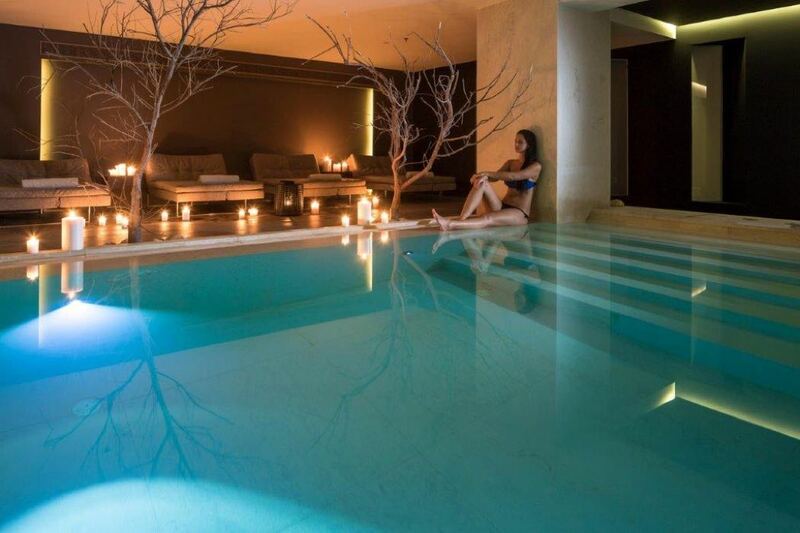 the same ultra modern design is softened by the natural stone walls and pool which makes this a truly relaxing space. Fly into Kos (KGS) direct from Stanstead with Ryanair or Thomas Cook Airlines, or from Gatwick with Eastjet from around £44 each way. Don’t forget to take some time to explore the island of Kos. There are hundreds of of beautiful beaches, pretty villages and a host of archaeological sites. It is also worth noting that this is an adult only hotel. Guests must be over 16 years old. 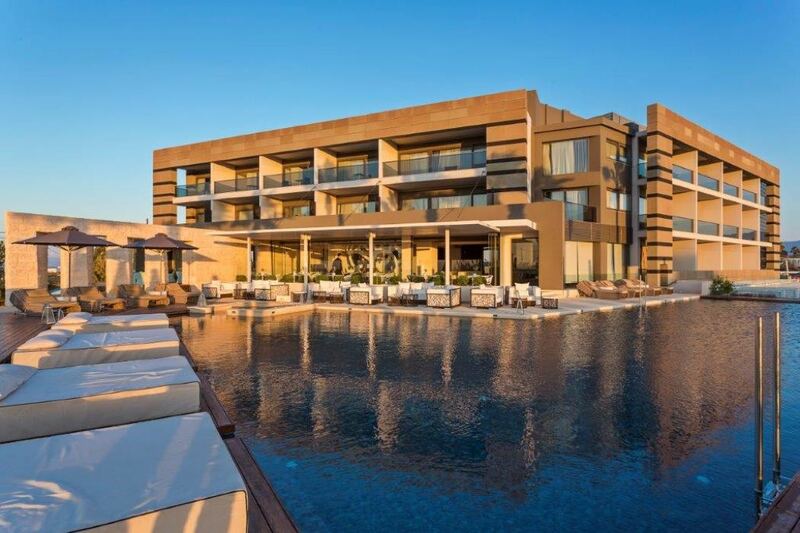 The Beachside Aqua Blu Boutique Hotel & Spa is the perfect place to enjoy sun-drenched days by the pool, serene evening cocktails in the bar, intimate fine dining at the hotel restaurants or lively nights in Kos. Whatever you prefer, you will not find a more beautiful setting in Kos.